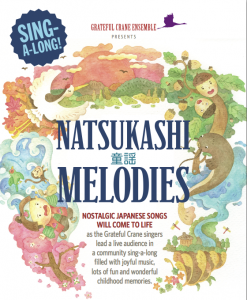 GARDENA — The Grateful Crane Ensemble’s “Natsukashi Melodies” sing-along show will be presented once again on Sunday, Oct. 28, at 2 p.m. at the Gardena Valley Japanese Cultural Institute, 1964 W. 162nd St., Gardena. Presented for the first time last month at Nishi Hongwanji Buddhist Temple in Los Angeles and again last Sunday at Orange County Buddhist Church, the sing-along of nostalgic Japanese children’s songs and traditional folk songs proved to be a joyful journey back in time for many in attendance. Although somewhat quiet and reserved at first, by the time the show reached its second act, the majority of the audience was singing out loud and strong, and by the end they wanted to sing more, said Kashiwagi. Along with the singing, it was the childhood memories that these songs evoked that made the event enjoyable. Several Nisei elders recalled singing these songs as children with their Issei parents. Some of the favorites from the show include “Akatombo,” “Furusato,” “Haru ga Kita,” “Momiji,” “Yuyake Koyake,” “Donguri Koro Koro,” “Momotaro,” “Hana” and many more. Along with the nostalgic memories, Kashiwagi added that studies have shown that music and singing alleviate stress, relieve depression and are good for one’s overall health and well-being. Plus, he said, it’s just plain fun. Leading the sing-along will be long-time Grateful Crane members Keiko Kawashima, Kurt Kuniyoshi, Helen Ota and Fusako Shiotani. Grateful Crane’s musical director, Scott Nagatani, will accompany everyone on piano. Tickets are $25. To make a reservation, call the Grateful Crane ticket line at (310) 995-5841.